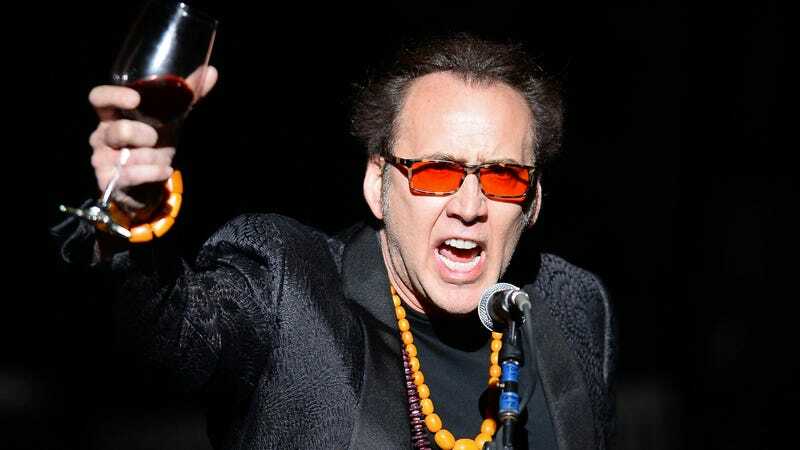 Nic Cage, inveterate yeller and American treasure, has a new film coming out April 6. Titled The Humanity Bureau, it’s a sci-fi film about the coming disasters wrought by climate change, and some ill-considered responses to that crisis. But more importantly, you can watch Cage in VR. Variety reports Cage’s new film is set to be accompanied by the March 2 of a series of standalone episodes of VR content called “The Humanity Bureau VRevolution,” thus named by people who never thought to say it out loud while coming up with it. (“Vee-are-evolution”? Or “Vee-revolution”? Neither one really works.) It’s not entirely clear what the “standalone episode” explanation means, as the other episodes are described as “alternative storylines that co-exist with the feature film.” Given that Cage probably didn’t shoot much additional content, the implication is you can watch the events of the film unfold from someone else’s point of view—someone who almost certainly doesn’t interact with Cage all that much—meaning the other episodes are likely less-successful versions of the film’s narrative. Of course, for the real Bureau-heads out there, any additional content is good content. The film takes place in a near future where global warming is ravaging the American Midwest. The title refers to a “government agency that exiles members of society deemed unproductive and banishes them to a colony known as New Eden.” We’re going to assume that name is ironic, the way you sometimes nickname a big guy “Tiny.” Cage plays a caseworker who tries to protect a woman and her child while exposing the secrets of the Bureau. The film’s producers explain that the movie was shot in three formats—standard theatrical, Barco Escape theatrical, and VOD—as a means of trying to “give viewers more options for alternative content within today’s new media.” Barco Escape, for the curious, is basically a giant three-screen, panoramic viewing format. And yes, if that sounds suspiciously like the silly technology behind a recent Home Video Hell candidate, give yourself a high-five: This is the same production company behind that misbegotten disaster of a tax write-off. Hopefully it’s learned a few things in the interim, and this film will make sense, or at least not actively frustrate efforts at comprehension. For those of us who prefer our movies in standard format, The Humanity Bureau will be released in theaters and On Demand April 6, almost a month after you can immerse yourself in the virtual experience of seeing Nic Cage pay off another summer home.